Whether you own a small fishing boat, sailboat or a larger yacht, a boat christening ceremony is a fun way to welcome your boat to the world, celebrate with friends, and ensure safe passages for a lifetime of adventures on the water. Boat christening ceremonies date back thousands of years and vary slightly around the world. We christened the new boat and now we're taking a little shakedown cruise. A proper christening ceremony will make you and your boat part of a nautical tradition rooted in ancient times. The following steps can be modified according to your personal preferences. Have fun! Galleyware Christening Bottle. This simulated bottle of champagne is double-scored around the middle to make it easy and safe to break. The broken glass is contained in the see-thru, fine-mesh sack. Christening a boat is a fun social event that should be enjoyed among a close circle of friends. Since the ceremony is normally followed by a small maiden voyage, we suggest you prelaunch your boat and have it ready at the dock. The traditional drink during a christening is red wine. 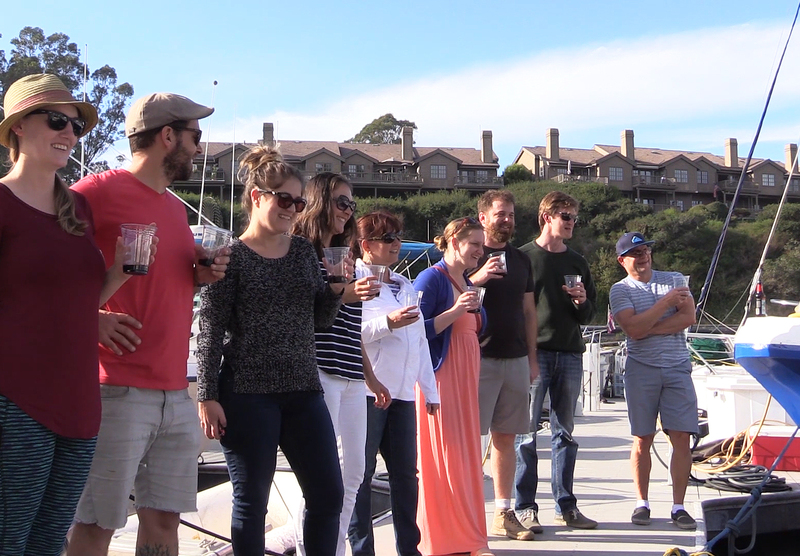 Captains used red wine to make a sacrifice to the sea gods and to celebrate with a toast. If you prefer cider or something else, go for it! A branch full of green leaves symbolizes safe returns. The leaves only need to be on the boat for the christening and maiden voyage. We used a branch off a lemon tree, but there is no specific requirement for the type of leaves. Modern christening ceremonies consist of saying a few words about the boat, toasting to the honor of the new boat's name and then breaking a bottle of champagne against the boat's bow—or pouring the contents onto the bow. The entire process usually takes less than five minutes. 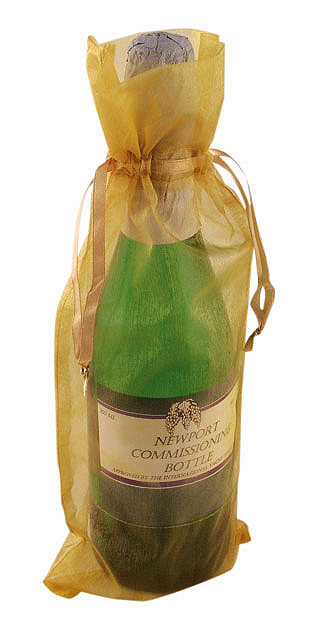 If you plan to break the bottle, we strongly suggest (for environmental reasons and safety concerns) you save your favorite libation for drinking and use a simulated bottle of champagne such as the Galleyware Christening Bottle, which is double-scored around the middle to make it easy and safe to break. The broken glass is contained in the included see-thru, fine-mesh sack. The folks at Galleyware also suggest that you break the bottle over a cleat or bow roller to avoid marring your boat's finish. We get it that everyone is busy and you will likely want to christen your boat on a weekend with nice weather, when all of your friends are free. Great! Saturday and Sunday are awesome days to do a ceremony. The following days however, are considered unlucky due to significant religious events. Friday is unlucky likely because Jesus was crucified on this day of the week. In fact, if a new Coast Guard boat is finished on a Friday, they always wait until Saturday to christen it. Thursday is a bad day to be on the water because it’s Thor’s day, and he's the god of thunder and storms. Don't want to mess with him! The first Monday in April is the day Cain slew Abel. It might also be April Fool's Day. 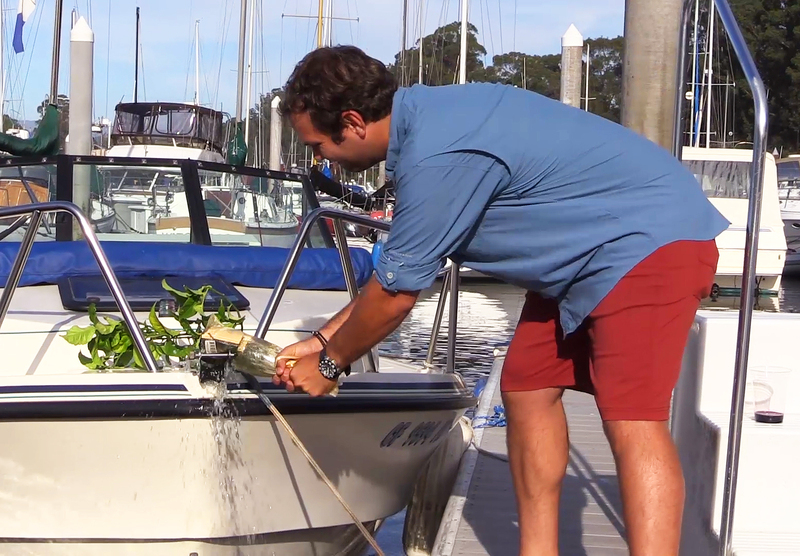 The big moment as I break the Galleyware Christening Bottle over a stainless steel anchor roller. No scratches in my gelcoat! Notice the leafy lemon tree branch on deck. There is a lot of superstition around renaming a boat . . . and for good reason. If you talk to enough boat owners, or walk around your local harbor, there are always a handful of boats with wacky names because people are afraid to rename their boat. Okay, some folks just don’t have good taste! If you do not properly rename your boat, you are doomed to a lifetime of bad luck. Fortunately, properly renaming a boat is not impossible if you follow this systematic process. Before you rename a boat at a christening ceremony, you must systematically remove/cover all instances of the boat’s old identity. It is critical that the old name is completely removed before you say the new name out loud, or bring anything on the boat with a new name. Be patient and thorough while removing all instances of the previous name. If you get through the whole process, christen your boat and then find a trace of the old name, we suggest christening again! 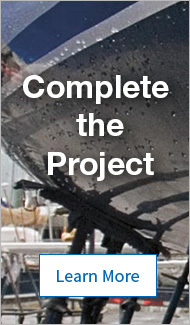 You’ll want to eliminate the old name on the boat itself by removing the exterior paint or lettering; however, you’ll also need to check whether the boat has ever been repainted. If so, you need to get down to previous layers and literally scrape off the old name. It is not enough to just paint over the old name. The same applies for the interior of the boat. Make sure any fixtures; badges, engravings, upholstery, or decorations with the old name are obliterated or removed. My friends are enjoying the show. You must get rid of any accessories with the old boat name. Common accessories are floatation devices/rings, brass bells, clothing, coffee mugs, floating key chains, license plate frames, and the list goes on. The tricky part is what to do with all the paperwork like cruising journals, maintenance logs, and receipts. It is ok to keep the paperwork, but you must cover the old name with whiteout every time it is written. Facebook and digital media in general have surely complicated things and obviously we cannot look to history for answers on what to do here. To stay consistent with the tradition of removing the old boat’s identity, we suggest looking at your digital footprint. Archive any Facebook posts or photos showing the name. If you belong to any online boating communities, make sure your boat’s name is not in your signature. You do not have to delete all previous photos of the boat, just make sure the name is not visible. Thank you for reading about boat naming and christening ceremonies with us and congratulations on your new boat! We welcome you to share your experiences with us on your favorite social media sites. About Mike Montgomery: Growing up in Northern California, Mike traded in a life dedicated to surfing the white wave (snowboarding) for new adventures on the coast of the Pacific Ocean. In 2013 he joined the Marketing Team at West Marine and enjoys listening to a passionate set of Customers, learning about unique products and being an advocate for a life well lived on the water. 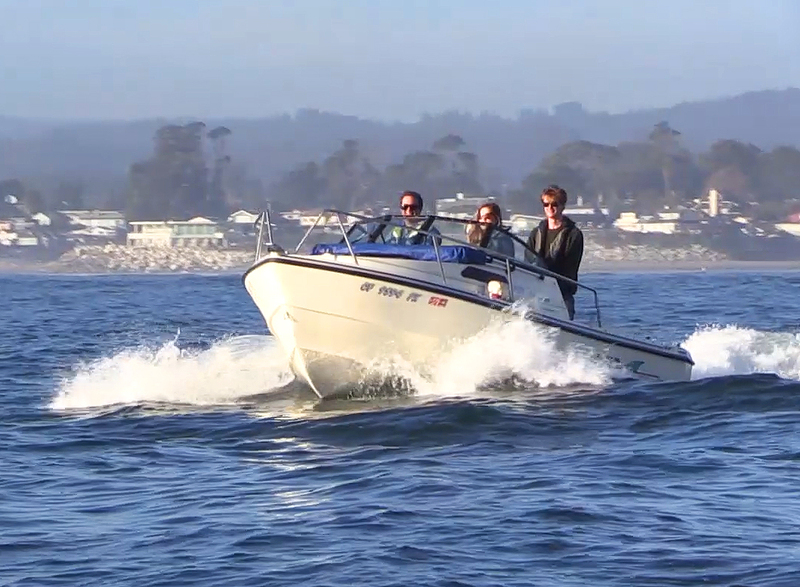 Mike’s adventures on the Monterey Bay include sunrise paddleboarding alongside sea otters, learning how to sail on West Marine's company sailboat, ProMotion, and most recently purchasing his first boat, a 17ft. Arima Sea Ranger. Mike is quickly learning the “ins and outs” of boat ownership the way any millennial does, through hours of YouTube videos, hundreds of internet searches and bouncing ideas off seasoned boaters. He invites you to follow his journey through West Marine!